Apptega is here to help. 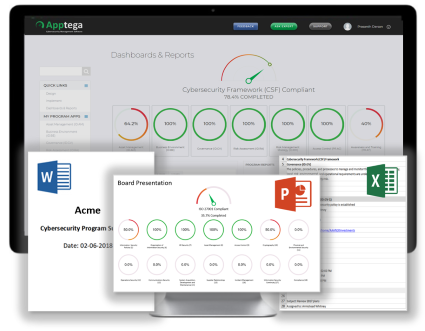 Apptega delivers one-click reporting for assessments, audits, customer requests and Board presentations saving hundreds of hours of admin time with real-time data. You can show the end-to-end story of your entire cybersecurity program including real-time compliance scoring, achievements over time, areas of focus, project life cycles, and future implementation road maps for the next 12 months. An entire program with crisp dials, graphs and charts can be exported into PowerPoint, Excel and Word in seconds, instead of hours and days. Want to learn more? Click here to schedule a demo today.